Click on the image below to view an invitation to a three-person exhibition at Paper-works in Napier. 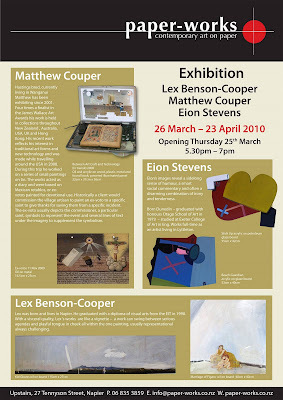 The exhibition opens this Thursday night, 5.30pm - 7pm, 25th of March, 2010 and will continue through to the 23rd of April, 2010. You will be able to view all the work in the exhibition on my website by the middle of this week and any enquiries can be directed to Annabel Sinclair-Thomson at Paper-works. 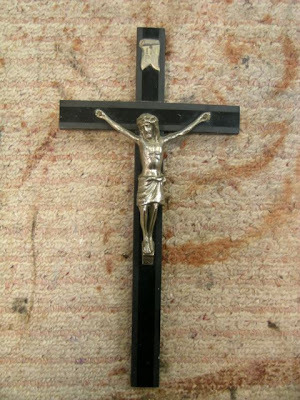 Although I really like this example, I'd love to find a slightly larger one with the skull and bones symbol at the base of the crucifix. 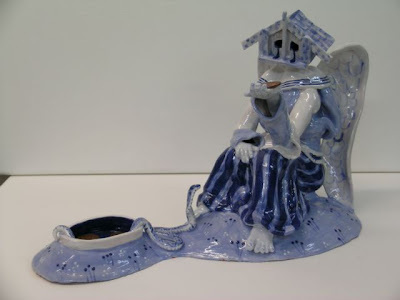 My version of Melancholia, a recently glazed ceramic piece. Glued to her hand is a new 10 cent piece. If you click here, you can view this piece in its raw state.